The Olympus Chrome Six is a series of dual-format folders, taking 6×6cm and 4.5×6cm exposures, made by Takachiho and later Olympus from 1948 to 1956. 6 The end: "No more Six!" The Olympus Chrome Six are horizontal folders, whose design is essentially an evolution of the previous Olympus Six. Unlike the latter, the Chrome Six has a wholly diecast construction; the Olympus company bought a diecasting plant in Itabashi which became the affiliated company Tōkyō Diecast K.K. (東京ダイカスト㈱) in 1951. The body casting introduced with the Chrome Six I was used on all subsequent models up to the Chrome Six V and RII. The folding struts look the same as on the Semi Olympus II and Olympus Six, and were originally inspired from the Balda products. All the models have the ability to take 4.5×6cm pictures using a mask. The back is hinged to the right and contains two red windows, one for each format, protected by horizontally sliding covers inscribed 4.5X6 and 6X6. The bottom of the camera has two film flanges and a tripod attachment in the middle. No model of the Olympus Chrome Six is marked as such, and the inscriptions on the camera identify it as an "Olympus Six" instead. The name "Olympus Chrome Six" and the various model numbers only appear in the advertising material and user documentation. All the models have front-cell focusing 75mm Zuiko lenses, with either f/3.5 or f/2.8 aperture. They have a Copal shutter except for some very early cameras. The Olympus Chrome Six I, II and III have a flat all-chrome top plate. There is a tubular finder in the middle, with parallax indications and translucent blue strips showing the field of view for 4.5×6cm exposures. The advance knob is at the left end, as seen by the photographer. There is an accessory shoe to the left of the viewfinder, with the folding bed release just in front of it. The shutter release is at the usual location on the right. The top plate is engraved Olympus Six and has the serial number on the right of the viewfinder. The name OLYMPUS–SIX is also embossed in the back covering, under the red windows. On all the cameras, the aperture scale is situated above the shutter casing, and the shutter plate is black with depth-of-field indications at the top. The f/3.5 lens has a silver bezel with black markings and the f/2.8 lens has a black bezel with white markings. The approximate dimensions are 13×10×5cm, and the weight is 850g. The Olympus Chrome Six I was released in 1948. It has a Zuiko 7.5cm f/3.5 lens, with four elements in three groups, the same as on the postwar Olympus Six. Advertisements placed in the May to July 1948 issues of Ars Camera still describe the Olympus Six with Zuiko f/3.5 lens and Koho shutter (1–200, B, T), but they show a picture of a Chrome Six I with Wester N.S.D. shutter. (In the document dated June, the top part of the photograph was drawn over with a pencil or a brush, certainly because the camera's top plate was not enough visible in the white background, due to the poor print quality.) When these advertisements were published, the Chrome Six was either already available for sale or at an advanced development stage. A larger version of the same picture — reproduced below — was used in an article on Japanese camera production in the December 1949 issue of Photo Art, more than one year after that particular camera was produced; for some reason, the text of the article confusingly describes the Olympus Six camera with Koho shutter instead of the current product. On that larger picture, the lens number is legible as 32797. The shutter, made by Nishida, was used on some of the earliest cameras, before the young Copal company was able to supply its own shutter. It gives 1–200, B, T speeds, has a red-dotted self-timer lever and the name WESTER. N.S.D. at the base of the speed rim. Olympus Chrome Six I, Zuiko 7.5cm f/3.5 no.32797, Wester N.S.D. shutter (1–200, B, T). The Olympus Chrome Six II was released the same year, 1948 — one source specifies October. It only differs by the Zuiko 7.5cm f/2.8 lens, which was newly developed for this camera, and is said to have five elements in four groups. The Chrome Six I and II evolved in parallel until the release of the model III. All the Chrome Six I and II models have a low film flange at the right end of the top plate, as seen by the photographer, and a release button surrounded by a small milled ring. The early Chrome Six I and II are distinguished by the low accessory shoe made of sheet metal. They also have thin folding struts, with a small rivet at the articulation. There is a spring visible under the folding bed release, and an arrow on the advance knob indicating the turning direction. The earliest cameras have an uncoated lens, engraved Zuiko 1:3.5 f=7.5cm Takatiho Tokyo No.xxxxx (or 1:2.8). "Takatiho" is an alternative spelling of Takachiho, the name of the Olympus company at the time. The known lens numbers for the uncoated lenses are in the 32xxx to 34xxx range; the same sequence is shared by the f/3.5 and f/2.8 lenses. The earliest known example has f/3.5 lens no.32603 and is owned by the Olympus company. (Its lens number is lower than no.32707, the highest lens number known on an Olympus Six.) It has a Copal shutter (1–200, B, T), with a thread for a cable release and no flash synchronization, and has no marking at the bottom of the shutter plate. The aperture is controlled by a short index above the shutter housing. At least one very early surviving camera is known with a Wester N.S.D. shutter. It has f/3.5 lens no.32932, very close to no.32797 visible in the May 1948 advertisement. On this camera, the bottom film flanges are smaller and the tripod attachment is cruder than on regular production examples; it is unclear if other early cameras share the same features. The other cameras observed so far with an uncoated lens have the Copal shutter and the name OLYMPUS at the bottom of the shutter plate. At some point, the folding bed release became thicker and lost its apparent spring. The cable release thread disappeared around the same time. The Olympus official website offers a wallpaper whose background is an extract of a blueprint for the early Chrome Six I. The body still has the thin accessory shoe, the small rivets on the folding struts and the apparent spring under the folding bed release. The lens marking has Takatiho Tokyo and corresponds to an uncoated f/3.5 lens, with no.43001. The speed rim has B, 1–400 markings and something beginning with KO at the bottom, certainly "KOHO". This might indicate that the company had plans to resume the production of leaf shutters with a new Koho to 1/400; however, this is a mere supposition and no other element has been found to confirm it. The Chrome Six I and II received a coated lens at some point. The lens marking became Olympus Zuiko Coated 1:3.5 f=7.5cm No.xxxxx (or 1:2.8). The known lens numbers are in the 52xxx to 59xxx range, showing a gap from the previous range, certainly because the intermediary numbers were allotted to the 4.0cm lenses of the Olympus 35. Reinforced folding struts were introduced at about the same time, recognized by the larger rivets at the hinge. The very first examples with a coated lens have a TAKATIHO TOKYO marking at the bottom of the shutter plate, instead of the previous OLYMPUS. This marking was short-lived because the company changed its name from Takachiho to Olympus on January 1st, 1949. After that date, the bottom of the shutter plate became plain black and the OLYMPUS TOKYO logo embossed on the leather of the folding bed was replaced by an OLYMPUS OIC logo. "Olympus OIC" stands for Olympus Optical Industrial Company, a translation of the full name Olympus Kōgaku Kōgyō K.K. 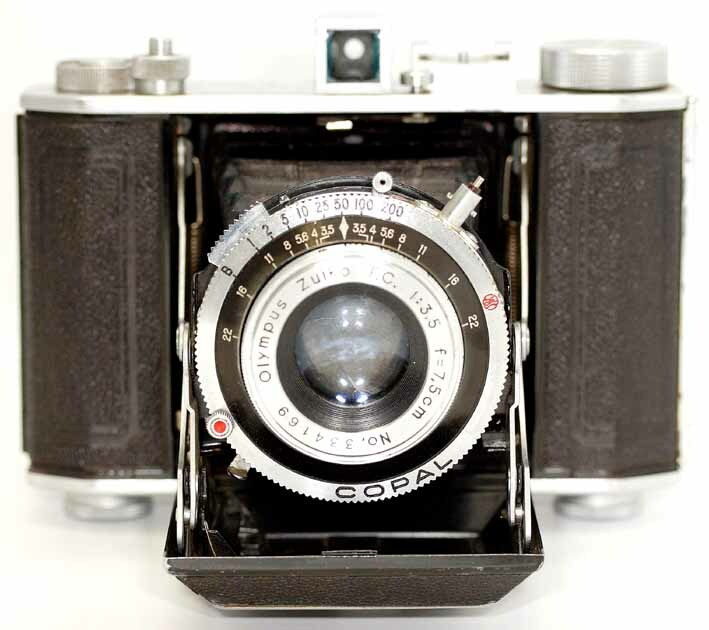 At about the same time, the Copal shutter received a red CPL logo on the speed rim. The last examples with the thin accessory shoe date from that period, around early 1949. According to Matsuzaki, the monthly production in 1949 was about 400 units, and many cameras did not pass the final quality inspection because of poor assembly or defective parts, and were adjusted at the end of the month by the most experienced workers. The toolings and assembly process were gradually improved and these problems were finally overcome. Olympus Chrome Six I, Zuiko Coated 7.5cm f/3.5 lens no.54726, Copal shutter (1–200, B, T), no flash sync. The body has the reinforced struts and diecast accessory shoe. The lens assembly has the short aperture index. There is a gap in the observed body numbers between 24744 and 30076, and it seems that the numbers in the 25xxx to 29xxx range were attributed to the Olympus 35. The Chrome Six I and II received a thicker diecast accessory shoe shortly after the start of the new batch. Many sources wrongly say that this diecast accessory shoe is a distinguishing feature of the Chrome Six III, and this is a frequent source of confusion. Some examples made in that period have a MADE IN OCCUPIED JAPAN marking on the leatherette strip covering the back latch. The short aperture index was replaced by a longer milled part at some time; the transition occurred around lens no.59000. It seems that the Chrome Six was not advertised in Japan until mid-1950. The earliest reported advertisement in a Japanese magazine is in the August 1950 issue of Kohga Gekkan. The text mentions the "constant popularity" of the camera at export, suggesting that the Chrome Six was initially made for export only. The advertisement lists the model I for ¥11,500 and the model II for ¥13,600 (without the case). The lens is called "Coated Zuiko" (コーテッドズイコー); the pictured camera has the Olympus Zuiko Coated marking, and perhaps the diecast accessory shoe. The company is mentioned as Olympus Kōgaku of Shibuya, Tokyo, with the OLYMPUS OIC logo. Sugiyama shows a picture of a Chrome Six I belonging to the Olympus company, with a Koho shutter (1–200, B, T) and the f/3.5 lens no.7182, marked Takatiho Tokyo. The caption says that it is a prototype of the Chrome Six made around 1946, of which three were made. The body has the diecast accessory shoe and reinforced folding struts which were introduced on the Chrome Six after some thousand examples were made; it is thus highly unlikely that this camera was an early prototype of the Chrome Six. The body also has two round parts on the top plate, one of which is partly hidden by the shoe, and whose purpose is unknown. Lens no.7182 has the lowest number known for a Zuiko f/3.5, and was made in 1940 when the Olympus Six was released. This camera was probably used by the company for experiments around 1949, and ended up for some reason with a prewar lens and shutter assembly, certainly kept from the early Olympus Six prototypes. The lens marking was altered again after some time, and became Olympus Zuiko C. 1:3.5 f=7.5cm No.xxxxx (or 1:2.8), with a red C. The observed lens numbers are in the 84xxx to 88xxx range for the f/2.8 lenses and in the 89xxx to 94xxx range for the f/3.5. The gap from the 59xxx range perhaps corresponds to lenses made for the Olympus 35 or sold to Mamiya for the Mamiya Six. A few cameras were assembled with the Zuiko C. f/3.5 lens in the 89xxx range and an unsynched Copal shutter (1–200, B, T). Some of these have been observed with an ASA synch post, which is probably not original. Shortly after that, the shutter was replaced by a newer synchronized Copal, with an ASA bayonet synch post at the top, giving B, 1–200 speeds instead of 1–200, B, T. It has an S.COPAL marking above, next to the aperture scale. Olympus Chrome Six II no.39615, Zuiko C. 7.5cm f/2.8 lens (red C.) no.86524, Copal shutter (B, 1–200), ASA synch post. The synchronized Chrome Six I and II were first advertised in Japanese magazines dated September 1950. The advertisement in the December 1950 issue of Asahi Camera lists the Chrome Six I for ¥14,000 and the Chrome Six II for ¥16,000 (case included), as well as the Olympus Flash II (オリンパスフラッシュⅡ型) for ¥2,550. It says that the Olympus Flash was the first Japanese flashgun equipped with a bulb ejector. The picture shows a Chrome Six II with a flash gun mounted on a bracket attached to the bottom of the camera, and a synch cord plugged in the Copal shutter. The lens is called "Coated Zuiko" again but the lens markings on the picture are illegible. The advertisement mentions the maker Olympus Kōgaku Kōgyō and two authorized dealers: Nihon Shōkai in Tokyo and Takachiho Shōkai in Osaka; the latter is perhaps a dependent company of Olympus. The English user manual for the synchronized Chrome Six I and II shows a similar picture on the front cover and the OLYMPUS OIC logo on the back cover. One of the inside pictures clearly shows the diecast accessory shoe, small film flange and ASA synch post, and the cameras are called "Model I" and "Model II". The lenses are called "Coated Zuiko". The text says that the camera has enjoyed a high reputation "during the past fifteen years", certainly indicating that the manual was printed in 1951, fifteen years after the company's first camera. After the adoption of flash synchronization, the body numbers rose to the 39xxx range, then jumped to the 15xxxx range, with six digits. From that point onward, the batches allotted to the Chrome Six bodies and lenses became wider, and the lenses were not mounted on the bodies in strict ascending sequence. It seems that the production was gaining pace, and this is confirmed by stories of people queuing in the Tokyo camera shops to buy the new cameras which were brought at night by train from the Suwa plant. It is said that the camera was nicknamed "chonmage", a traditional Japanese men's haircut (see here at Wikipedia), certainly because the tubular finder in the middle has some shape similarity. On the next batch of f/3.5 lenses, with numbers known in the 113xxx to 115xxx range, the marking was unchanged but for the C. in black instead of red. The corresponding batch of f/2.8 lenses has numbers in the 120xxx and 121xxx range and the C. in white instead of black. The shape of the arrow in the winding knob was changed at some time, around body no.155000; the older arrow has a twin tail and the newer arrow has a simpler design. Olympus Chrome Six II no.157914, Zuiko C. 7.5cm f/2.8 lens (white C.) no.120929, Copal shutter (B, 1–200), ASA synch post. The lens marking was altered again before the switch to the model III, certainly after the introduction of coating on all the lens elements. It became Olympus Zuiko F.C. 1:3.5 f=7.5cm No.xxxxxx (or 1:2.8), where "F.C." stands for Full Coated. The F.C. lenses observed on the late Chrome Six I and II have numbers in the 116xxx to 119xxx range for the f/3.5, and in the 123xxx to 124xxx range for the f/2.8. One isolated example of the Chrome Six II is known with a Zuiko F.C. lens in the 301xxx range, certainly taken from the next batch produced for the Chrome Six III. All these are certainly dated late 1951 or early 1952. The Olympus company felt that its Zuiko lenses could not reveal their full potential because of limitations of the body. The switch from a pressed steel construction to a diecast body with the introduction of the Chrome Six was a first step in ensuring a precise positioning of the film, but Olympus wanted to make a step further. Film curling was an issue, notably because of the shallow depth-of-field of the Zuiko f/2.8 lens at full aperture, and the company concentrated its research on film flatness. Two main directions were explored: (a) improving the precision of the film chamber and pressure plate and (b) designing a device to maintain the film in position. Measures were made with a microscope and it was found that the film position was already irregular immediately after winding, and worsened after some minutes. The main result of this research is a film tensioning device: a coil spring is mounted on the advance side to prevent backlash of the take-up spool, and another spring is mounted on the supply side to tension the film. The device was first introduced on the Olympus Chrome Six III described below. It was called "film plane corrector" in the original literature in English language, and "film plane stabilizing device" (フィルム面安定装置) in the original Japanese documents. A side effect of this research was that the distance scale was found inaccurate and subsequently recalculated. The Olympus Chrome Six III is an evolution of the Chrome Six I and II, with the addition of the "film plane corrector". The small film flange at the right end of the top plate was replaced by a larger part containing a film reminder, and certainly covering the film tensioning spring. It is often said that the bigger diecast accessory shoe and the synchronized shutter are specific to the Chrome Six III, but this is a mistake. The English user manual of the Chrome Six III emphasizes the "film plane corrector" as the main innovation of the new model, and also mentions the film reminder. The Japanese leaflet reproduced below also presents the "film plane stabilizing device" and the film reminder as new features of the model III. The Chrome Six III was released in two versions, with the f/3.5 lens and with the f/2.8 lens. Most modern sources say that the former was called "Chrome Six III A" and the latter "Chrome Six III B". However none of the original documents observed so far shows these names, and the A and B letters were perhaps used on later models only. The new model was first advertised in Japanese magazines dated May 1952, and featured in the new products column of the July 1952 issue of Asahi Camera. 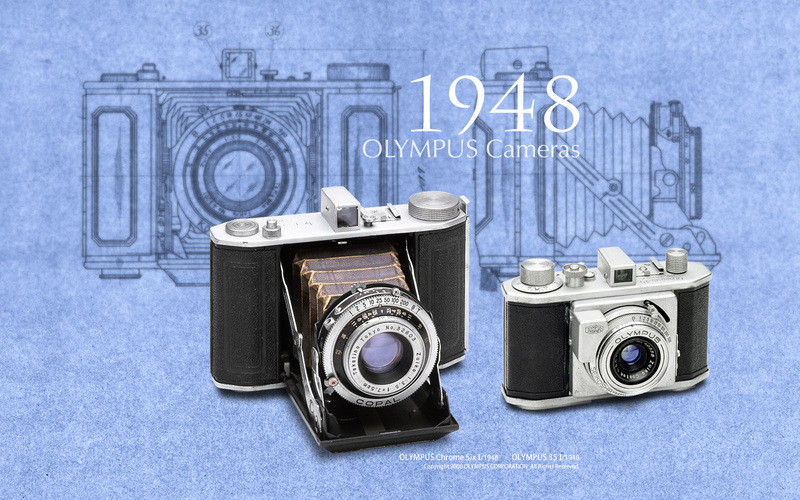 Some sources, including the Olympus company itself, give 1951 as the release date, perhaps by mistake. The price in Japan was ¥16,000 for the f/3.5 version and ¥18,000 for the f/2.8 version. Leaflet presenting the Olympus Chrome Six III. The first batch of Chrome Six III is recognized by a body number preceded by No. The lowest known body number is 176351, pictured in the user manual and perhaps corresponding to a prototype. Higher body numbers are known on the last Chrome Six I and II, up to no.178404. The second lowest number known on a Chrome Six III is 178706, and the highest in that batch is 195624. Together with the release of the model III, the lens number sequence jumped at 300000 for the f/2.8 lens and 330000 for the f/3.5. It is said that the f/2.8 lens switched from five elements in four groups to four elements in three groups around the release of the Chrome Six III; this might correspond to the batch starting at 300,000. The lens marking is almost unchanged: Olympus Zuiko F.C. 1:3.5 f=7.5cm No,xxxxxx (or 1:2.8), where the lens number is preceded by No, with a comma. In this batch, f/2.8 lenses have been observed in the 300xxx to 313xxx range, and f/3.5 lenses in the 330xxx to 338xxx range. On the body, the part surrounding the release button was gradually modified. The earliest examples have the same low milled ring as on the Chrome Six I and II, which was soon replaced by a higher milled ring on some transitional bodies. The bulk of the production have a larger part, forming a cup for the release finger. In any case, the part can be unscrewed and is sometimes missing on the examples found today. A few isolated examples of the Chrome Six III are found with an older Zuiko C. lens in the 8xxxx or 9xxxx range. A few examples also have an older Copal shutter giving 1–200, B, T speeds, with or without flash synchronization. The Olympus company reorganized the numbering of its products around 1953: the single body number sequence, shared by all the products, was abandoned, and each model got its own sequence starting at 100001. The body number of the Chrome Six III thus restarted at 100001 for the main production batch; and the resulting numbers are distinguished from the earlier ones by the absence of the No. prefix. The same occurred for the lenses, and the Zuiko F.C. f/3.5 and f/2.8 lenses received two different sequences, starting at 100001 each and without the No, prefix. The lens engravings are also distinguished by a new typeface, notably adopting a straight "1" digit with no bar and an open "4" digit. The company abandoned the OLYMPUS OIC logo and switched back to the OLYMPUS TOKYO logo at that time, and the latter appears on the Chrome Six III shortly after the beginning of the main production batch. These was the last minor changes for the model III, and the beginning of true mass production. Olympus Chrome Six III, D.Zuiko F.C. 7.5cm f/3.5 lens no.134410, Copal shutter to 1/200, ASA synch post. The Zuiko F.C. f/3.5 lens was replaced in 1954 by the recomputed D.Zuiko F.C., using a new type of optical glass. The lens marking accordingly became Olympus D.Zuiko F.C. 1:3.5 f=7.5cm xxxxxx. The new name indicates that the lens has four elements, D being the fourth letter in the alphabet. The f/2.8 lens was unchanged, perhaps because it was a more recent design (released in 1948). The D.Zuiko F.C. f/3.5 was numbered in the same sequence as the last Zuiko F.C. f/3.5 without No, prefix. The lowest number observed so far is 113869, on a camera which perhaps belongs to the Olympus company. It is said that the D.Zuiko was introduced in January 1954. Advertisements dated July and December 1953 do not list the new lens, and the first reported advertisement mentioning the D.Zuiko is dated March 1954. The advertisement in the May 1954 issue of Shashin Kōgyō lists the Zuiko f/3.5 and the Zuiko f/2.8 and says that the camera is also sold with the D.Zuiko f/3.5; this is typical of the transitional period when the old and new f/3.5 lenses were side by side in the stocks and on the dealer shelves. A specific advertisement for the D.Zuiko appears in the September 1954 issue of Asahi Camera and in the November-December 1954 issue of Shashin Kōgyō. It says that the lens was mounted on the Mamiyaflex Automat A, Mamiya Six, Elmoflex, Airesflex, Olympus Chrome Six III and Olympus 35 IV D (perhaps a typo for IV B). It also mentions Walz Shōkai and Takachiho Shōkai as authorized dealers for the Olympus cameras. Monthly production eventually rose to 5,000 units by 1954. At some point it was felt that the factory was producing too much for the demand, and the head office decided to slow down, for fear of making piles of unsold cameras. The highest numbers observed on a Chrome Six III are body no.160464, f/2.8 lens no.125621 and f/3.5 lens no.134410. Olympus Chrome Six IVb, Zuiko F.C. 7.5cm f/2.8 lens no.123498, Copal shutter. The Olympus Chrome Six IV has a new top housing, containing an uncoupled rangefinder combined with the viewfinder. The main body is the same as on the model III. The viewfinder window is offset to the right, as seen by the photographer, and there is a smaller round window for the second image. The rangefinder is set by a knob moved by the left thumb, and the distance must be manually reported on the focusing scale. The accessory shoe, folding bed release and Olympus Six marking are above the rangefinder. The body serial number is on the right of the shoe, above the viewfinder, and does not have a No. prefix. The film reminder and the advance knob are the same as on the late model III. The release button is shorter and has no surrounding part. The Chrome Six IV was designed as an emergency measure, because the sales of the model III were slowing down and the stock of bodies was growing. Matsuzaki Sōichirō says that he was given about ten days to find a way to improve the already existing bodies, adapting a rangefinder unit supplied by a third party. He first tried to graft the rangefinder unit directly onto the top plate of the model III, so that the bodies could be modified at a minimal cost, but the attempt was unsuccessful and a new top housing had to be designed. The Chrome Six IV was made for three months starting in November 1954, and it was advertised and featured in Japanese magazines dated February and March 1955. Two versions exist: the Chrome Six IVa with the D.Zuiko F.C. f/3.5 lens and the Chrome Six IVb with the Zuiko F.C. f/2.8. These names, with a lowercase "a" and "b", appear in the February 1955 advertisement in Asahi Camera, where the IVa and IVb are respectively priced at ¥17,500 and ¥19,500, and the model III is mentioned as still available. One example of the Chrome Six IVb with lens no.300200 is pictured in an article by Sakurai Eiichi about the history of Olympus, dated October 1958. The picture certainly comes from the company and perhaps shows a prototype. The known body numbers of the Olympus Chrome Six IV are in the 167xxx to 179xxx range. The numbers for the Zuiko F.C. f/2.8 lens are in the 130xxx to 132xxx range, and the numbers for the D.Zuiko F.C. f/3.5 are in the 132xxx to 139xxx range. It is sometimes said that the IVa and IVb were also called "Chrome Six RI A" and "RI B", where "RI" presumably means "Rangefinder model I". This may have been an internal company code name for the camera, but has not yet been observed on any original document. Olympus Chrome Six VA, D.Zuiko F.C. 7.5cm f/3.5 lens no.144860, Copal shutter. The next model is called Olympus Chrome Six V in the English user manual and Olympus Six V or Olympus Six 5 in the original Japanese documents. The new model has no rangefinder and a sleeker top housing, and replaces the Chrome Six III. The viewfinder is offset to the left, as seen by the photographer, and is integrated into the top housing. The recessed accessory shoe is to the right of the finder. There is a lever on the back, switching a reducing mask built in the finder for the 4.5×6cm format; this lever can be actuated only when the back is open. The release button has a peculiar wedge shape, probably designed to reduce vibration. The folding bed is opened by a rectangular button at the top of the front door. The advance knob is replaced by a short lever actuated by the left thumb; the lever is spring loaded and the mechanism includes a ratchet wheel. Seven strokes are needed to advance from the first to the second exposure in 6×6cm format, and five strokes in 4.5×6cm format; the number of strokes decreases towards the end of the film roll. The advance is still controlled by red windows, placed the same as on the previous models. The camera includes the film plane corrector developed for the model III. The name OLYMPUS SIX is engraved above the viewfinder, and the body serial number is engraved behind the release button. The front door has the name Olympus Six embossed in the leatherette covering. The back door has the OLYMPUS TOKYO logo at the bottom left instead of the previous OLYMPUS–SIX marking. The Chrome Six V has a newer Copal shutter with a PC synch socket and a thread for a cable release. The top speed is 1/200 on the early examples and 1/300 on the late ones. The depth-of-field and aperture scales have a silver instead of black background. The distance scale is graduated in metres or in feet, probably depending on the market. The camera exists in two versions: the Olympus Chrome Six VA has the D.Zuiko F.C. f/3.5 lens and the VB has the Zuiko F.C. f/2.8. Both have a black lens rim with white markings, whereas it was silver with black markings on the previous f/3.5 models. Columns in the November 1955 special issue of Photo Art. The Olympus Chrome Six V has a special feature to compensate the drifting of the focus point when the diaphragm is closed, an inherent flaw of the front-cell focusing lens designs of the time. The device is called "adjusting graduator" or "correcting scale for displacement of focus" in the English user manual; the latter corresponds to the Japanese term "correcting scale for the displacement of focus according to the diaphragm" (絞りによる焦点移動の補正目盛). It simply consists of hairline marks underlining the distance numbers from 2m inwards, drawing a segment from the regular graduation mark towards the left. The regular graduation is used at full aperture (f/3.5 or f/2.8), the middle of the hairline mark is used at f/5.6 and the other side of the segment is used at f/8 and beyond. This system was an effort of the Olympus company to provide the best possible focusing precision, without having to redesign the camera for unit focusing. However it has little practical utility on a viewfinder-only camera, because the error made by most users in guessing the distance to the subject is usually much greater than the correction. The design of a successor to the Olympus Chrome Six III advanced slowly because the model was meeting a large success, but the pace increased in 1954 when sales of the model III were declining. The Olympus Chrome Six V was released in 1955, and one source specifies January. It was first featured and advertised in Japanese magazines dated April 1955. The price was ¥14,500 for the "VA" and ¥16,500 for the "VB". For some reason, the f/2.8 lens is called "E Zuiko" in the April 1955 advertisement in Shashin Kōgyō; this might indicate that it still has five elements. The top speed is announced as 1/200 in advertisements as late as September 1955 and in articles as late as November of the same year; it is not known if the 1/300 top speed was ever advertised. The last reported advertisement is dated October 1956. The body numbers of the Olympus Chrome Six V seem to follow the same sequence as on the model III and IV. Observed numbers are in the 178xxx to 189xxx range. The known lens numbers are in the 140xxx to 148xxx range for the D.Zuiko f/3.5, and in the 130xxx to 138xxx range for the Zuiko f/2.8. Olympus Chrome Six RII A no.115364, second variant, D.Zuiko F.C. 7.5cm f/3.5 lens no.153790, Copal shutter to 1/200. The last model of the line is called Olympus Chrome Six RII or Olympus Six RII. The "RII" in the name presumably stands for "Rangefinder model II". The Olympus Chrome Six RII has an uncoupled rangefinder, an advance lever and an auto-stop advance device. The top housing is designed in the same style as the Chrome Six V. The uncoupled rangefinder is driven by a knob falling under the right thumb, then the distance reading is manually transferred to the lens focusing ring. The viewfinder eyepiece is offset to the left, the same as on the Chrome Six V, and the round second image window is on the right. The advance lever is the same as on the model V. The mechanism includes an additional auto-stop advance device, used for 6×6cm exposures only, with an exposure counter visible under a small window at the extreme left. The advance lever moves freely while number "1" is displayed in the exposure counter, and the position of the first exposure is set via the red window. Once the first picture is taken, the user must press a small button above the top plate, engaging the auto-stop mechanism from the second exposure onwards. The camera exists in two versions: the Chrome Six RII A with the D.Zuiko F.C. f/3.5 lens and the Chrome Six RII B with the Zuiko F.C. f/2.8. The Olympus Chrome Six RII evolved during its production run, and three variants are known. The first variant certainly makes use of unsold Chrome Six III cameras. The top housing does not come down on the front of the body, unlike the top part of the Chrome Six V. The folding bed is the same as on the model III, and the opening button is above the top plate, between the viewfinder and rangefinder windows. The shutter release is a simple cylindrical button, not the stylish button of the model V. Even the leatherette covering is the same as on the model III, with imprints at the front on both sides, the OLYMPUS TOKYO logo on the folding bed and OLYMPUS–SIX on the back. It seems that the cameras of the first variant were made from finished Chrome Six III bodies, complete with their leatherette covering; also, that the body number sequence certainly restarted at 100001 for the Chrome Six RII: the first variant has been observed with body numbers in the 101xxx to 108xxx range. On the first variant of the Chrome Six RII, the lens and shutter are the same as on the model III, with an ASA synch post, black depth-of-field and aperture scales and a silver rim for the f/3.5 lens. The known lens numbers are in the 117xxx to 134xxx for the f/3.5 and in the 124xxx to 129xxx range for the f/2.8. These lens numbers are in the same range as the late model III and early model IV. This is a further indication that the early Chrome Six RII were made from already finished examples of the Chrome Six III. It seems that the marks for the "correcting scale for displacement of focus" are added to the distance scale as an afterthought. Olympus Chrome Six RII A no.107368, first variant, D.Zuiko F.C. 7.5cm f/3.5 lens no.134784, Copal shutter to 1/200. The second variant of the Olympus Chrome Six RII differs by the folding bed and the lens and shutter unit. The opening button has moved from the top housing to the front door itself, which is now identical to that of the model V. The shutter release is the same cylindrical button as on the previous variant, and the embossings in the leatherette covering are the same. The lens and shutter unit is the same as on the model V, with a PC synch post, a cable release thread, silver depth-of-field and aperture scales and a black rim on the f/3.5 lens. Examples of the second variant have been observed with body numbers in the 110xxx to 115xxx range, and the known lens numbers are in the 149xxx to 153xxx range for the f/3.5, and perhaps in the 139xxx range for the f/2.8. One isolated example has been observed with 1/300 top speed. None of the original documents found so far mentions the availability of 1/300 top speed, and it seems that this feature was never officially announced. The third variant of the Olympus Chrome Six RII has a top housing coming down further on the front side, similar to that of the model V. The shutter release has a newer shape, the same as on the model V. It seems that the embossings in the leatherette covering have the newer pattern inaugurated on the model V too, but only the absence of the imprints at the front is confirmed. The third variant has only been observed with the f/3.5 lens so far, and the few lens numbers observed are in the 153xxx and 155xxx range, none of these examples having 1/300 top speed. The example with lens no.155652 is owned by the Olympus company; it has a shutter release made of black plastic instead of silver metal, and its lens number is the highest noted for the D.Zuiko F.C. f/3.5 on any Olympus folder. The Olympus Chrome Six RII was featured in Japanese magazines dated June 1955, and the first advertisements were published the same month. The first variant is pictured in a leaflet perhaps dated June 1955, giving the price of ¥17,500 for the RIIA and ¥19,500 for the RIIB. The first variant is also pictured in the October 1955 advertisement in Asahi Camera and in articles in the October and November 1955 special issues of Photo Art. The second variant is pictured in the March 1956 advertisement in Asahi Camera. The end: "No more Six!" The excessive production rate of the Olympus Chrome Six III, followed by the decision from the headquarters to slow the pace of the factory and to release the Chrome Six IV as an emergency measure, was perceived by the company as a failure. The fact that the Chrome Six RII sold in 1955 still seem to make use of older unsold parts gives a hint of the magnitude of the overproduction. Learning from that experience, the company decided to concentrate on 35mm cameras because the 6×6cm models had no future; this was summarized in the slogan "No more Six!" (ノーモア・シックス). The development of new folders was stopped around 1955 and the last advertisements for the Chrome Six V and RII appeared in October 1956. 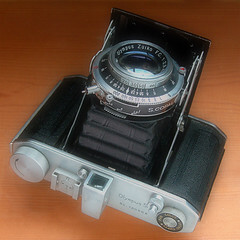 The Olympus Flex TLR was abandoned at the same time, the last advertisements for this model appearing in November 1956. ↑ Plant in Itabashi, becoming Tōkyō Diecast K.K. in 1951: Sakai, p.7 of Kurashikku Kamera Senka no.20. ↑ Leaflet for the Olympus Chrome Six III, reproduced in this article. ↑ Advertisement in Ars Camera May 1948, p.20, and advertisement reproduced in Kokusan kamera no rekishi, p.125. The camera is described as a version of the Olympus Six with tubular finder and accessory shoe in Kokusan kamera no rekishi, p.348, but this is clearly a Chrome Six. ↑ Column in Photo Art December 1949, pp.36–7. ↑ Matsuzaki, p.16 of Kurashikku Kamera Senka no.20. ↑ October 1948: Matsuzaki, p.16 of Kurashikku Kamera Senka no.20 and p.28 of Kurashikku Kamera Senka no.76. ↑ The chronology at the Olympus official site says that the model II was equipped with a film surface stabilizer, but this is a confusion with the model III. ↑ Five elements in four groups: Sakurai Eiichi, p.372 of Shashin Kōgyō no.78; Matsuzaki, p.16 of Kurashikku Kamera Senka no.20. ↑ Example pictured in this page (archived) and this wallpaper (archived) of the Olympus official website, in Matsuzaki, p.16 of Kurashikku Kamera Senka no.20, in Francesch, p.62, in Sugiyama, item 1373, in McKeown, p.748, and in Orinpasu-ten, p.4. ↑ Example observed in an online auction (body no.20848, f/3.5 lens no.32932). This particular example has a PC synch post which is certainly not original. ↑ Example pictured in Hibi, p.65 (f/3.5 lens no.33162), example pictured in Francesch, p.63, in Sugiyama, item 1374, and in Matsuzaki, p.28 of Kurashikku Kamera Senka no.76 (f/2.8 lens no.33797), and examples observed in online auctions (f/3.5 lens no.33575; body no.21090, f/3.5 lens no.33856; body no.21930, f/3.5 lens no.3476x). ↑ It is absent on body no.21090 (f/3.5 lens no.33856). ↑ Examples observed in online auctions: body no.22617, f/2.8 lens no.52115; body no.22684, f/3.5 lens no.52230. They have the larger rivets. ↑ Date: History page (archived) of the Olympus official website. ↑ Meaning of OIC page of logos (archived) of the Olympus official website. ↑ Examples observed in online auctions: lens no.24606, f/3.5 lens no.54755; body no.24744, f/3.5 lens no.54798; body no.30076, f/2.8 lens. ↑ Matsuzaki, p.29 of Kurashikku Kamera Senka no.76. ↑ Lowest numbers with diecast shoe: body no.30667, f/3.5 lens no.55108, observed at a Chinese dealer. ↑ Example observed in an online auction, body no.32647, lens no.56948. ↑ Highest numbers with short aperture index: body no.32923, f/3.5 lens no.58379, observed in an online auction. Lowest numbers with long aperture index: body no.34424, f/2.8 lens no.59495, observed in an online auction. ↑ Advertisement reproduced in Kokusan kamera no rekishi, p.125. No earlier advertisement is listed on p.348 of the same source. ↑ Sugiyama, item 1372. A poor copy of that picture is reproduced in this page of the Map Camera Museum (archived). ↑ Example pictured in this page at Caméra de collection (archived) (probably has lens no.89107); example pictured in this page by Ross Alford (lens no.89442), and examples observed in online auctions: body no.35950 (lens no.89493), and body no.36490 (perhaps lens no.89973). ↑ Pictures of the manual observed in an online auction. ↑ Highest five-digit number observed: body no.39869 (f/3.5 lens no.92828), seen in an online auction. Lowest six-digit number observed on a Chrome Six I or II: body no.150167 (lens no.85998), seen in an online auction. ↑ Story told in this page of the Olympus official website (archived). ↑ "Chonmage" nickname: Sakurai Eiichi, p.373 of Shashin Kōgyō no.78. ↑ Highest body number with the older arrow: no.154x77 (observed in an online auction). Lowest body number with the newer arrow: no.155713 (observed in an online auction). ↑ The lenses are called "Full Coated" in the English user manual for the Olympus Chrome Six III reproduced here at butkus.org, and フルコーテッド in a Japanese leaflet for the Chrome Six III, observed in an online auction. ↑ Example observed in an online auciton, body no.176657, f/2.8 lens no.301625. ↑ Matsuzaki, pp.16–7 of Kurashikku Kamera Senka no.20. ↑ Results presented in the English user manual for the Chrome Six III available here at butkus.org. A schema of the experimental apparatus is given in Matsuzaki, p.30 of Kurashikku Kamera Senka no.76, from Sakurai Eiichi's book Firumu-men no shomondai (フィルム面の諸問題, Film plane problems). ↑ Description: Matsuzaki, p.17 of Kurashikku Kamera Senka no.20 and p.30 of Kurashikku Kamera Senka no.76. ↑ "Film plane corrector": English user manual for the Chrome Six III available here at butkus.org. フィルム面安定装置: Japanese leaflet for the Chrome Six III observed in an online auction. ↑ The English user manual for the Chrome Six I and II cited above, and the chronology of the observed lens and body numbers, demonstrate that it is a mistake. It perhaps originated in Francesch, p.65, and was copied in McKeown, p.748, and in various websites, such as this page by Foster. Francesch curiously gives another version on p.29, saying that the Chrome Six II is distinguished by the diecast shoe and flash synch in addition to the f/2.8 lens; this is a mistake too. ↑ User manual available here at butkus.org. ↑ Kokusan kamera no rekishi, p.348. A guarantee card dated Aug 20th, 1952 has been observed with a Chrome Six III (f/3.5) in an online auction, confirming that the camera was available at that date. ↑ See this page of the Olympus official website (archived), Matsuzaki, pp.16–7 of Kurashikku Kamera Senka no.20. Francesch says 1950 on p.65 and 1951 on p.30. Foster says 1950 in this page at Biofos, certainly after Francesch. ↑ Prices stamped on the leaflet for the Olympus Chrome Six III reproduced in this article. ↑ Body no.176351: English user manual for the Chrome Six III available here at butkus.org. Chrome Six II no.178404 observed in an online auction. ↑ Body no.178706 and 195624 observed in online auctions. ↑ Sakurai Eiichi, p.373 of Shashin Kōgyō no.78. ↑ Lowest body number with the release cup: 184436 (observed in an online auction). ↑ Example with f/2.8 lens no.84894 (observed in an unknown website); example with f/2.8 lens no.88424 (pictured on the front cover of the English user manual available here at butkus.org); example with f/3.5 lens no.92638 (observed in an online auction). ↑ Without flash synch: body no.178706 with f/3.5 lens no.331x98, and body no.181621 with f/3.5 lens, observed in online auctions. With flash synch: example with f/2.8 lens no.84894, observed in an unknown website. ↑ Body no.102865, f/3.5 lens no.101616, observed in an online auction. ↑ Highest number with OIC: body no.102606, f/2.8 lens no.101455 (observed in an online auction). Lowest number with TOKYO: body no.106428, f/3.5 lens no.103155 (observed in an online auction). ↑ New optical glass: advertisement for the D.Zuiko published in the November and December 1954 issue of Shashin Kōgyō, reproduced in Kokusan kamera no rekishi, p.127. ↑ Example pictured in Orinpasu-ten, cover page and p.4. ↑ Matsuzaki, p.17 of Kurashikku Kamera Senka no.20. ↑ July 1953: advertisement published in Shashin Kōgyō, reproduced in Kokusan kamera no rekishi, p.127. December 1953: advertisement published in Asahi Camera, reproduced in Kokusan kamera no rekishi, p.126. ↑ Kokusan kamera no rekishi, p.348. ↑ Advertisement reproduced in Kokusan kamera no rekishi, p.126. ↑ September 1954: advertisement reproduced in Hagiya, p.10 of Kurashikku Kamera Senka no.20. November-December 1954: advertisement reproduced in Kokusan kamera no rekishi, p.127. ↑ Matsuzaki, p.17 of Kurashikku Kamera Senka no.20 and pp.30–1 of Kurashikku Kamera Senka no.76. ↑ Matsuzaki, pp.30–1 of Kurashikku Kamera Senka no.76. ↑ Body no.160464 with f/2.8 lens no.125621 observed in an online auction. F/3.5 lens no.134410 on the example pictured in this page. ↑ Matsuzaki, p.17 of Kurashikku Kamera Senka no.20, and pp.30–1 of Kurashikku Kamera Senka no.76. ↑ 62.0 62.1 Matsuzaki, p.31 of Kurashikku Kamera Senka no.76. ↑ Matsuzaki, p.31 of Kurashikku Kamera Senka no.76. Francesch, p.66, says January to November 1954 by mistake. ↑ Advertisement reproduced in Kokusan kamera no rekishi, p.126, and in Hibi, p.64 of Kurashikku Kamera Senka no.8. ↑ Sakurai Eiichi, p.371 of Shashin Kōgyō no.78. ↑ Lowest is 167584, observed in an online auction. Highest is 179201, observed in an online auction. ↑ Lowest is 130240, owned by the Olympus company, pictured in Francesch, p.66, in McKeown, p.748, in Sugiyama, item 1376, and in Matsuzaki, p.17 of Kurashikku Kamera Senka no.20. Highest is 132359, observed in an online auction. ↑ Lowest is 132735, observed in an online auction. Highest is 139103, pictured in Matsuzaki, p.17 of Kurashikku Kamera Senka no.20 and p.31 of Kurashikku Kamera Senka no.76. ↑ Matsuzaki, p.17 of Kurashikku Kamera Senka no.20; Sugiyama, item 1376; this page of the Olympus Club website. The chronology (archived) of the Olympus official website mistakenly presents the Chrome Six IV and RI A as separate models. ↑ English user manual for the Olympus Chrome Six V reproduced here in the Chromesix website. Japanese advertisements reproduced in Kokusan kamera no rekishi, pp.126, 128 and 225, in Hibi, p.65 of Kurashikku Kamera Senka no.8, in Hagiya, p.10 of Kurashikku Kamera Senka no.20 and here in the Chromesix website. ↑ Moves only when the back is open: English user manual for the Olympus Chrome Six V, reproduced here in the Chromesix website. ↑ Number of strokes: November 1955 special issue of Photo Art, p.55. ↑ English user manual for the Olympus Chrome Six V, reproduced here in the Chromesix website. ↑ English user manual for the Olympus Chrome Six V, reproduced here in the Chromesix website. Japanese term: advertisements reproduced in Kokusan kamera no rekishi, pp.126 and 128. ↑ Details of the system: English user manual for the Olympus Chrome Six V, reproduced here in the Chromesix website; November 1955 special issue of Photo Art, p.55; "Shashinkai Nyūsu" column of the April 1955 issue of Asahi Camera, reproduced in Hibi, p.65 of Kurashikku Kamera Senka no.8. ↑ January: Matsuzaki, p.17 of Kurashikku Kamera Senka no.20. ↑ Advertisements dated April, May and September 1955 and March 1956 reproduced in Kokusan kamera no rekishi, pp.128 and 225, and in Hagiya, p.10 of Kurashikku Kamera Senka no.20. Articles in the October and November 1955 special issues of Photo Art. ↑ Advertisement reproduced in Hagiya, p.10 of Kurashikku Kamera Senka no.20. ↑ Advertisement published in the September 1955 issue of Asahi Camera, reproduced in Kokusan kamera no rekishi, p.128; article in the November 1955 special issue of Photo Art. ↑ "Olympus Chrome Six RII": leaflet reproduced in the Olympus official website (part 1 and part 2); article in the November 1955 special issue of Photo Art, p.55. "Olympus Six RII": advertisements reproduced in Kokusan kamera no rekishi, pp.126 and 225; article in the October 1955 special issue of Photo Art, p.83. ↑ The correcting marks have been observed on some examples, and the device is mentioned in all the documents about the Chrome Six RII, regardless of the pictured variant. ↑ Example with f/3.5 lens no.153417, observed in a website which is now dead. ↑ Francesch, p.69, however says that 1/300 top speed was introduced in 1956. ↑ Kokusan kamera no rekishi, pp.348–9. ↑ Leaflet reproduced in the Olympus official website (part 1 and part 2) (archived). ↑ October 1955 special issue of Photo Art, p.83; November 1955 special issue of Photo Art, p.56. ↑ Advertisement reproduced in Kokusan kamera no rekishi, p.225. ↑ Matsuzaki, p. of Kurashikku Kamera Senka no.76. Ars Camera Advertisement by Takachiho Kōgaku Kōgyō in May 1948, p.20. Olympus Kōgaku Kōgyō. Leaflet presenting the Olympus Chrome Six III. Date not indicated. Document reproduced in this Flickr set by Rebollo_fr. Photo Art rinji zōkan: Kamera no chishiki (フォトアート臨時増刊・カメラの知識, Photo Art special issue: Knowledge of cameras). October 1955, no.87 of the magazine. "Kokusan kamera no saiten 2. Supuringu kamera" (国産カメラの祭典・2・スプリングカメラ, Japanese camera festival 2, folding cameras). P.83. Photo Art rinji zōkan: Saishin supuringu kamera zensho (フォトアート臨時増刊・最新スプリングカメラ全書, Photo Art special issue: All the latest folding cameras). November 1955, no.89 of the magazine. "Supuringu kamera mihonshi", article on Japanese folders, pp.55–69. Sakurai Eiichi (桜井栄一). "Bodi kankei no sho-kikō (1): supuringu kamera no jidō sutoppu kikō" (ボディ関係の諸機構スプリングカメラの自動ストップ機構, "Various mechanisms for the bodies : automatic stop mechanism for folding cameras"). In Photo Art rinji zōkan: Kamera no chishiki (フォトアート臨時増刊・カメラの知識, Photo Art special issue: Knowledge of cameras). October 1955, no.87 of the magazine. Pp.118–9. Sakurai Eiichi (桜井栄一). "Orinpasu kamera no rekishi" (オリンパスカメラの歴史, "Brief History of Olympus cameras"). In Shashin Kōgyō no.78 (October 1958). Pp.371–5. Asahi Camera (アサヒカメラ) editorial staff. Shōwa 10–40nen kōkoku ni miru kokusan kamera no rekishi (昭和10–40年広告にみる国産カメラの歴史, Japanese camera history as seen in advertisements, 1935–1965). Tokyo: Asahi Shinbunsha, 1994. ISBN 4-02-330312-7. Items 441–50. Francesch, Dominique and Jean-Paul. Histoire de l'appareil photographique Olympus de 1936 à 1983. Paris: Dessain et Tolra, 1985. ISBN 2-249-27679-X. Pp.29–32 and 62–9. Hagiya Takeshi (萩谷剛). "Kōkoku kara miru Orinpasu kamera no nagare" (広告から見るオリンパスカメラの流れ, "Olympus camera history seen through the advertisements"). Kamera Rebyū: Kurashikku Kamera Senka (カメラレビュー クラシックカメラ専科) / Camera Review: All about Historical Cameras no. 20, 25 March 1992. No ISBN number. Orinpasu no subete (オリンパスのすべて, special issue on Olympus). Pp.10–1. Lewis, Gordon, ed. The History of the Japanese Camera. Rochester, N.Y.: George Eastman House, International Museum of Photography & Film, 1991. ISBN 0-935398-17-1 (paper), 0-935398-16-3 (hard). Pp.63 and 73–4. Maitani Yoshihisa (米谷美久). "Kamera-zukuri he no bōken" (カメラ創りへの冒険, "Venturing into camera production"). Volume 1 of Haikei — Sekkeisha yori (拝啓・設計者より, "Dear Sir, from the designer"). Published in the Zuiko Club website, belonging to the Olympus Imaging Corp.
McKeown, James M. and Joan C. McKeown's Price Guide to Antique and Classic Cameras, 12th Edition, 2005-2006. USA, Centennial Photo Service, 2004. ISBN 0-931838-40-1 (hardcover). ISBN 0-931838-41-X (softcover). P.748. Omoide no supuringu-kamera-ten (思い出のスプリングカメラ展, Exhibition of beloved self-erecting cameras). Tokyo: JCII Camera Museum, 1992. (Exhibition catalogue, no ISBN number.) P.23. Orinpasu-ten — oputo-dejitaru-tekunolojī no kiseki (オリンパス展・オプトデジタルテクノロジーの軌跡, Olympus exhibition, the tracks of opto-digital technology). Tokyo: JCII Camera Museum, 2005. (Exhibition catalogue, no ISBN number.) P.4. Sakai Shūichi (酒井修一). "Orinpasu no rekishi" (オリンパスの歴史, "History of Olympus"). Kamera Rebyū: Kurashikku Kamera Senka (カメラレビュー クラシックカメラ専科) / Camera Review: All about Historical Cameras no. 20, 25 March 1992. No ISBN number. Orinpasu no subete (オリンパスのすべて, special issue on Olympus). Pp.6–9. Sugiyama, Kōichi (杉山浩一); Naoi, Hiroaki (直井浩明); Bullock, John R. The Collector's Guide to Japanese Cameras. 国産カメラ図鑑 (Kokusan kamera zukan). Tokyo: Asahi Sonorama, 1985. ISBN 4-257-03187-5. Items 1372–9. "Zadankai: Orinpasu no michi" (座談会・オリンパスの道, "Conversation: the way of Olympus"). Interview of Sakurai Eiichi (桜井栄一), Maitani Yoshihisa (米谷美久) and Kawazoe Mitsuo (河添光男), by Saeki Kakugorō (佐伯恪五郎). Kamera Rebyū: Kurashikku Kamera Senka (カメラレビュー クラシックカメラ専科) / Camera Review: All about Historical Cameras no. 20, 25 March 1992. No ISBN number. Orinpasu no subete (オリンパスのすべて, special issue on Olympus). Pp.64–71. There is an Olympus Chrome Six RIIA in the Zeppan Tōsan photo site. The page cannot be accessed by a direct link: follow the link marked "武器庫" in the page menu, then the link marked "オリンパス　クロームシックスRIIA" in the next menu. This page was last edited on 14 December 2017, at 11:44.